Henry Charles Vowles was born in Yeovil in 1890. He was the son of innkeeper Levi Vowles (1858-1933) and Hannah Sarah nee French (1856-1935). Levi and Hannah had six children; Ethel Hester (b1887), Mary Ann M (b1887), William James (b1889), Henry, Sidney (b1893) and Jessie (b1896). Levi was the landlord of the Quicksilver Mail inn at the top of Hendford Hill and the family were listed there in the 1891 census. By the time of the 1901 census the family had moved to East Coker, where Levi described his occupation as 'Farmer & Road Contractor'. By 1911 the family had moved back to Yeovil and were listed at 23a Hendford. Levi's road contractor business was clearly doing well as he, his son William and 20-year old Henry were also in the family business and all three gave their occupations as road contractors. The family later moved to 2 Brunswick Street. Although the date is unknown, Henry enlisted at Taunton, joining the Royal Field Artillery with the Service Number 94384. He was later transferred to the 10th (Service) Battalion, Cameronians (Scottish Rifles). His new Service Number 19615 suggests this transfer took place in the summer of 1915. The 10th Battalion landed at Boulogne on 10 July 1915 and it is assumed that Henry was transferred at this time in order to go to France with his new battalion. On Monday 25 September 1915, the 10th Battalion became embroiled in the Battle of Loos - the British Army's contribution to the major Allied offensive launched simultaneously with the main French offensive in Champagne. It was the biggest British attack of 1915. A continuous preliminary bombardment, which showered 250,000 shells on to the German defences over four days, had little real effect. Before sending in the infantry on the morning of 25 September 1915, the British released 140 tons of chlorine gas from 5,000 cylinders placed on the front line to make up for the ineffective artillery barrage. This was the first time the Allies had used the weapon, coming after the Germans employed gas to terrible effect at Ypres in April earlier in the year, and it was hoped it would annihilate the Germans at Loos. However a change in the direction of the wind at several points along the front blew the gas back into the British trenches, causing seven deaths and injuring 2,600 soldiers who had to be withdrawn from the front line. Initially the gas attack created panic among the Germans and close to 600 men were gassed. Despite the setbacks caused by the wind 75,000 British infantrymen still flowed out from the trenches when the order came. British losses at Loos were exceptionally high with 50,000 casualties, including at least 20,000 deaths. The 10th Battalion, Cameronians (Scottish Rifles) lost 255 dead on this day. It is assumed that Henry Vowles was severely wounded in this attack. He was hospitalised but died from his wounds on 4 October 1915. He was aged 25 and was interred in Valenciennes (St. Roch) Communal Cemetery, Nord-Pas-de-Calais, France, Grave IV.B.14. 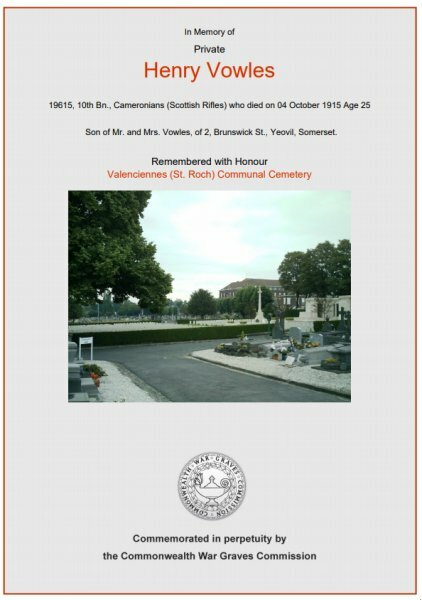 The Western Gazette, in its edition of 14 April 1916 reported "Mr and Mrs Levi Vowles, 2 Brunswick Street, Yeovil, have received news of the death from wounds received in action of their son, Private HC Vowles, of the Scottish Rifles. A Royal message of sympathy signed by Lord Kitchener, accompanies the notification." Henry's name is inscribed on the War Memorial in the Borough. 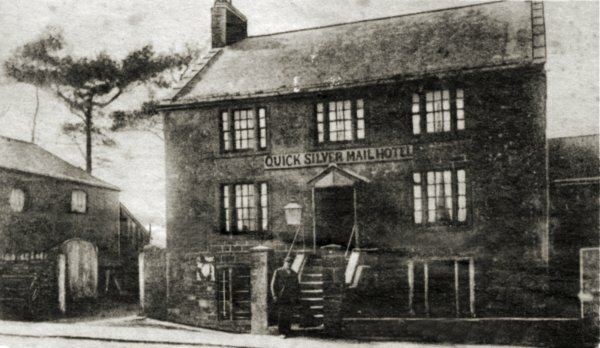 The Quick Silver Mail Hotel (as three storeys) photographed between 1911 and 1916. Henry had lived here when his father was the licensee in the 1890s. The Commonwealth War Graves Commission certificate in memory of Henry Vowles.